The one thing I wished someone would have told me when I was younger was how lonely adulthood would be. Especially when you move to a new place. I wish someone would have told me that you have to make some serious efforts to find new friends. It's probably easier for some people than others; I can't imagine that everyone in the world becomes a nervous wreck around large groups of strangers. How do I get over my social anxiety? I guess my point is: even though I don't have much going on most days besides cooking, blogging, and watching trashy daytime talk shows (which, I'm convinced are just huge multi-product infomercials under the guise of something else, holy product placement, Batman! ), it still took me weeks to get around to making these cupcakes. They were delicious, I should have made them sooner. I love campfires and I love making hot dogs and s'mores over an open fire. I used to skewer hot dogs and marshmallows and cook them over the burner on my parent's gas stove to mimic the effect at home, my friends thought I was weird. The difficult part about making these cupcakes is the marshmallow frosting. Most recipes for regular marshmallows contain a lot of gelatin so it becomes solid. Most recipes for marshmallow creme contain no gelatin which makes it spread too much at room temperature, and we definitely don't want a frosting that will melt right off of your cupcakes. What I did here was split the difference and use only one packet of gelatin so the marshmallow frosting was pipable, but solid enough to sit on top of a cupcake without spreading and melting off at room temperature. You could decorate these cupcakes any way you want. What I've laid out here is how I did it, but you could do the melted chocolate, graham crackers, and marshmallow frosting in any order you'd like. These cupcakes are really rich. I highly recommend having them with a cold glass of milk or water. Place flour, sugar, cocoa powder, baking soda, and salt in a large bowl, whisk to combine. If there are large chunks that aren't breaking up, sift the mixture. In a large liquid measuring cup, combine oil, water, vanilla, and vinegar. Add the wet ingredients to the dry ingredients and whisk well until you get a homogeneous cake batter with no clumps. Divide batter evenly between the 12 cupcake liners. Bake 18 to 20 minutes until a toothpick inserted in the center of each cupcake comes out clean. Let cool to room temperature. Melt chocolate in a bowl over a small saucepan of simmering water. 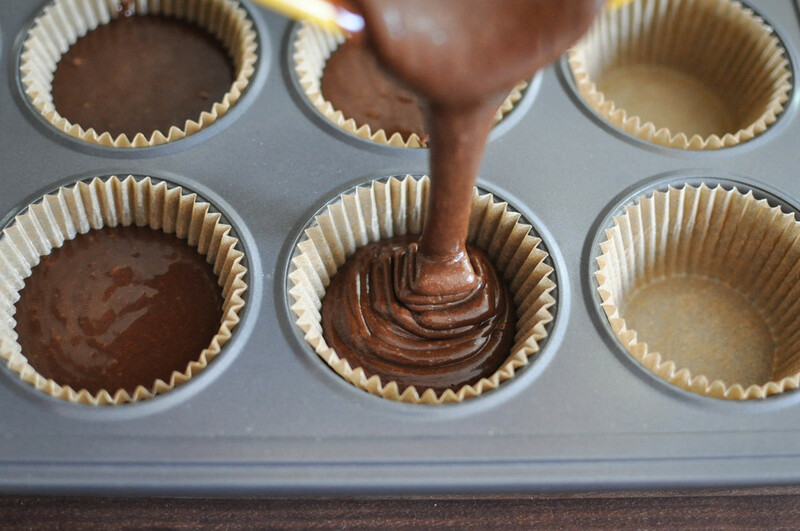 Take each cupcake and dip tops in chocolate. Sprinkle some graham cracker crumbs on top. Place in fridge to set the chocolate for 20 minutes. Keep the remaining melted chocolate around, you will use it later for drizzling. While the cupcakes are chilling, make the marshmallow frosting. Place water in a small bowl, sprinkle gelatin over it. Combine sugar, corn syrup, water, and salt in a small saucepan. Heat the mixture over medium heat until it reaches 240 degrees F. While the sugar mixture is heating, place egg whites and cream of tartar in the bowl of a stand mixer and beat on medium high until stiff peaks form. Add gelatin to sugar mixture and stir until melted and well combined. Drizzle the sugar mixture a tablespoon at a time into the egg whites so it doesn't scramble. Continue beating on medium high for another 7 to 8 minutes until the mixture is fluffy and shiny. Add vanilla and beat for another minute. Let the marshmallow frosting cool to room temperature. Place marshmallow frosting in a piping bag with an Ateco 806 or Wilton 1A tip. Do a test pipe on a clean plate. If the frosting spreads just a tiny bit, but mostly holds its shape, it's ready. If it spreads too much, place in the fridge to cool for 10 to 15 minutes (the question here is "do you think the frosting can sit atop a cupcake without melting right off?" Answer: Yes, then proceed! Answer: No, then wait for it to cool more). Pipe marshmallow frosting onto each cooled cupcake, making sure to leave a little room around the edges in case the frosting spreads a bit. 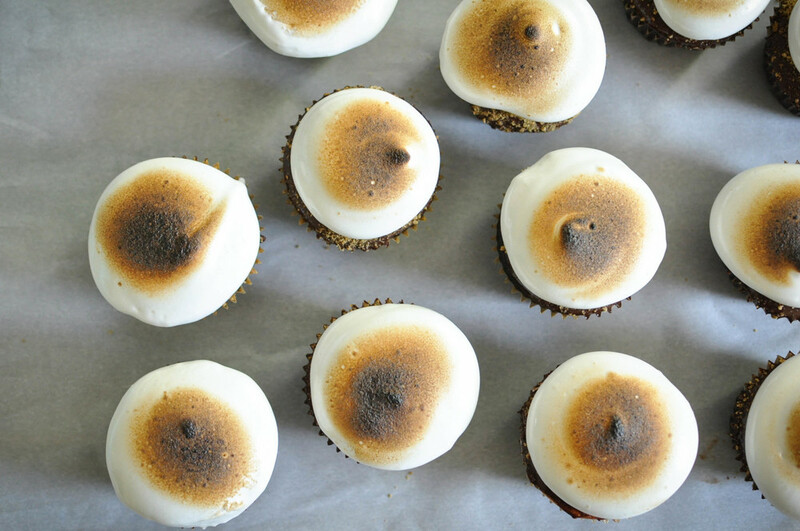 Optional: taking a butane torch, toast the tops of each cupcake so you get that burnt marshmallow effect as if you roasted it over an open fire. 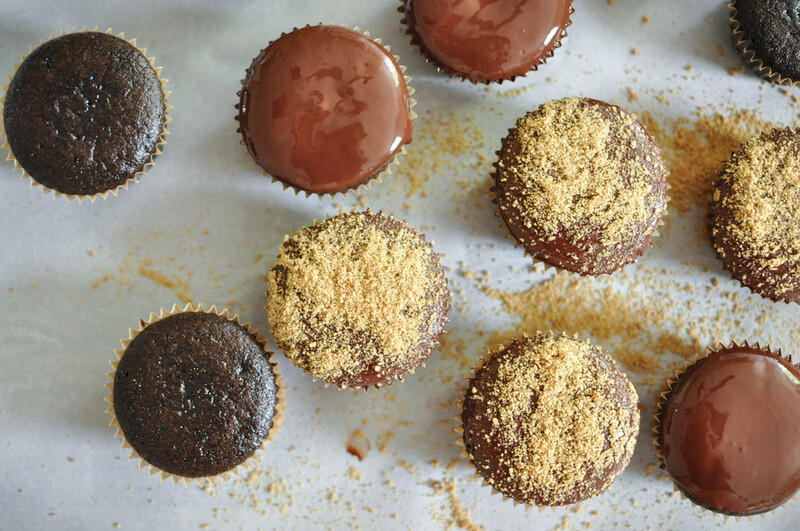 Taking the melted chocolate from earlier, drizzle the rest of it over each cupcake. Top with some more graham cracker crumbs, chill for another 10 minutes to set the marshmallow and chocolate, and enjoy!